Well, I haven't seen much in the way of reviews of First in Space, so I'm here to help alleviate that. 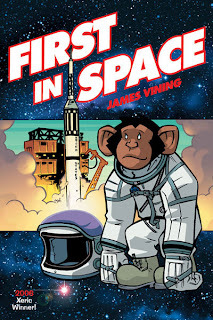 The basic story is that of Ham, a very real chimp who was in NASA's space program back in the early 1960s. The thrust of the story follows Ham going through the training program in preparation for his now-historic space flight and, more significantly, the emotional impact he has on the various trainers, engineers and program directors. The story is a fairly simple one, and author James Vining's artwork underscores that notion. The book is in black and white, using almost cartoonish drawings to illustrate the story. Despite that simplicity, though, he takes great care to render each monkey individually. They are all distinct in their visuals as well as their personalities, even without any lines of dialogue. I'm not sure if Vining chose to do that simply to differentiate them visually, but it has the end effect of humanizing the monkeys in a way that helps to emphasize how and why they were able to emotionally connect with the various human characters. I think that people often view animals (of any variety) with a very broad view -- an elephant is an elephant is an elephant. Anyone, though, who's had multiple pets should be able to tell you that every dog, cat, ferret, iguana, or whatever animal they have has a personality as unique as you or I. But, for whatever reason, that doesn't seem to always translate across species and visitors wandering through a zoo see only a collection of lions or tigers or bears, and don't recognize that each one is going to behave differently based on who they are as an individual. So what Vining does is bridge that gap exceptionally well. We see Ham as a unique character, distinct and separte from the others. He's a chimpanzee, certainly, and I don't think we forget that, but he's a chimp that we can understand and empathize with. I think that's what I found most pleasantly surprising about First in Space. The book does indeed give us the basic run-down of the space program of that time, including some of the politics with appearances by pre-space-flight-but-still-heroic John Glenn and then-Vice-President Lyndon Johnson. But it's the character study of Ham that is what the more attractive pull to the book. Overall, I was pleased to read this. It read fairly quickly, and the only weakness in the storytelling that I came across was how Vining showed a dream sequence. (Not that it didn't work, just that it took an extra moment to recognize it as such. A very minor quibble to be sure, but it's one of those that stands out against the superb quality of everything else.) Vining obviously took a lot of care in this book and it shows. It's a steal at only ten bucks, well worth the price of admission. You really can't go wrong with Xeric award winners in the first place, and this is just another example of why.